On Friday evening, the 4th of January, bishop Julian Ruiz Martorell awaited Our Lady of Częstochowa in front of the cathedral of Santa Maria (the Holy Mary) in Huesca in Aragon. This city saw the birth of St martyr Laurent (Laurentius) who was burnt on a grate in 258 during the persecution of Christians in Rome. Bishop Julian Ruiz welcomed Mother of God and then the Icon was carried into the cathedral in a procession. The bishop presided over the Holy Eucharist. In the homily the he emphasised the meaning of the modern day big confrontation between the agressive civilisation of death and the civilisation of life. After the celebrations in the cathedral the Icon of Our Lady, accompanied by the bishop, was solemnly carried to the convent of the Carmelite Sisters of the Assumption of the Most Holy Virgin Mary, which is situated only 200 metres from the cathedral. During the visit in the convent the Carmelite Sisters beautifully sang in honour of the Mother of God, also African songs. Next the bishop led the Vespers. The procession with the Icon of Our Lady went to the neighbouring convent of the Sisters of St Clara, where adoration was held throughout the night till 8 AM. On Saturday, the 5th of January, the day started with the Holy Mass at 8 AM celebrated by bishop Damian Iguacen Borau, the bishop emeritus of Teneriff. After the Icon was carried to the next convent of Carmelite Sister of St Theresa. Here in the chapel, before the Black Madonna the Sisters renewed their vows. Then the Holy Rosary in defence of life and family was said. Holy Eucharist was celebrated and in the course of it a young married couple gave a testimony by telling how the physicians pressed them to have an abortion of their child because of medical reasons. Their daughter was born live and is now a big joy of their parents. The next place to visit in the town of Huesca was the parish of the Mother of God, the Help of Christians, where the Holy Mass was presided over by bishop Julian Ruiz who is exceptionally strongly involved in the defence of life. During the homily he referred to his personal contacts with Poland and his visit to Jasna Góra. 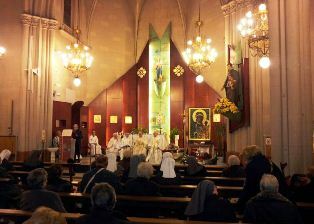 Additional splendour to The Holy Mass was added by the singing of a lady professor from the music conservatory in Huesca. The individual adoration lasted till 5.30 PM. Next in the company of the bishop the Icon was carried in a procession to the convent of calced Carmelitan Sisters of the Incarnation of Jesus, known in Huesca as the Carmelite Sisters of St Michael. The representatives of Family ministry in Huesca Diocese led the Holy Rosary in defence of life and family, and then the sisters sang the First Vespers of the Epiphany. “Te Deum” was solemnly sang and the Act of Dedication of the Protection of the Civilisation of Life and Love to the Mother of God was renewed. A few sisters gave their testimony that they had found their vocation to live in a convent during the meeting of John Paul II with the Young in Częstochowa. After the celebrations, before the Life Mobil`s departure many people took pictures with the Black Madonna who visited their family town. All prayers were led by bishop Julian Ruiz. The visit ended at 8 PM. At night the Icon of Our Lady went to the Marian shrine of Torrecidad.